Doctor Who: THE LOST DIMENSION Volume 1 Review @comicstitan | Warped Factor - Words in the Key of Geek. Tony gets lost in a special Who story. If you’re going to take the time and the imagination to write a multi-Doctor story, it should deliver celebration. It should deliver treats beyond the simple joy of seeing our favourite incarnations of our favourite Time Lord talking to each other. It should of course deliver instances of different incarnations of our favourite Time Lord talking to each other, because we want to know if anyone else thinks their relationship would play out the way we imagine it. And let’s face it, we all imagine it. There should be an adversary or a problem epic enough to need multiple Doctors on the case. And if you deploy a Doctor, they should have enough to do so that they make their mark on the story. In that regard, the comic-book medium’s much better placed than any other to deliver good multi-Doctoring, because it’s free of the constraints of human mortality and ageing, so every Doctor can be as alive and vivid as ever they were, rendered in the pages of a comic-book. 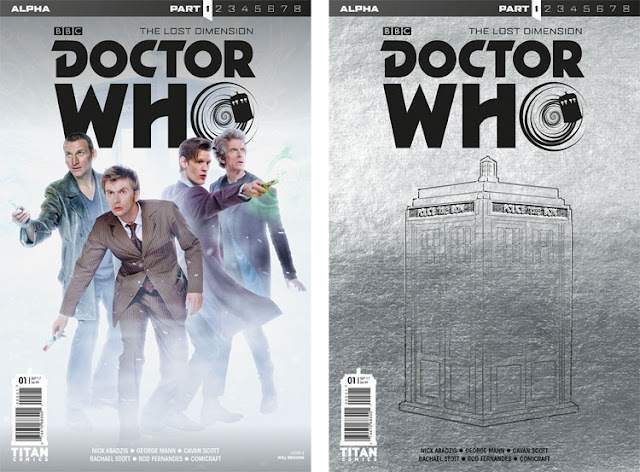 Let’s make one thing clear: Titan Comics gives good Multi-Doctor. It has a history of bringing Doctors together in ways that build on what we know from the TV version, that interweave the TV canon with additional detail and depth and angles, while fully integrating its own Titan-specific adventures, companions and dilemmas into things of beauty and Christmas dinner-full sighs of satisfaction. You’re going to want to pick up The Lost Dimension, Volume 1. What you have here is a set of separate adventures, each of which are epic in their own right, and each of which, with the insidiousness of gravity, begin to orbit a central dilemma of universe-shattering proportions as they spin on. There are more Doctors here than you can shake a sonic at – all the New Who Doctors with the exception of the War Doctor and 13 (who will start to feature in comic-books once she’s appeared on screen) have a major story-strand of their own. A surprising handful of Classic Doctors make appearances too, some in speaking roles, others, so far, in flashback. Each of the New Who Doctors’ storylines is more than a little massive and exciting, with either monsters or characters that will make you cheer. The tone and pace of each Doctor’s adventure is pitched perfectly for their period too – the Ninth Doctor has a snarling fight with someone, while running into characters he never met on screen, giving fans of Seventies Who at least two major thrills and name-dropping a character that will give them another. The Tenth Doctor’s story is frenetic and throws difficulty after difficulty after the chatterbox Time Lord, building up to an almost absurdly epic chase sequence, another cheer from the Seventies fans, and an ominous note. The Twelfth Doctor’s story is set during Series 10, with Bill, Nardole and the Vault in the university in Bristol. We can safely tell you there’s a heartwarming moment for all Doctor Who fans of a certain age when the university’s library is revealed to be the Terrance Dicks Library (Google it, youngsters! ), and the Doctor’s in for a shock when he has something of a reunion. Of them all though, it’s the Eleventh Doctor’s storyline that will give most fans the highest-pitched squeegasm, as a major threat leads Eleven and his comic-book companion Alice way, way back in time to a place it shouldn’t be possible for him to go, to do things it shouldn’t be possible for him to do. George Mann, Cavan Scott and Nick Abadzis have all got serious Who-writing form, especially in the Titan comic-book series, so these are authors who know their Who, know the tones of each of their Doctors and their companions, and know how to build their threats, their thrills and their emotional beats. Relax, you’re in good hands here. As for the artwork and colour – likewise, there’s a group of extremely well-experienced artists and colourists at work here, including Rachael Stott, Mariano LaClaustra, I.N.J. Culbard, Adriano Melo and Carlos Cabrero. They’ve all surpassed expectations on various Who comic-book projects at Titan, besides having bulging portfolios elsewhere, and they bring the scope, the scale, the immediacy and intimacy of the writers’ imaginations to life, while delivering character portraits that look very much like the people they’re supposed to be – which with a cast list this impressive becomes increasingly important the further on you read. The environments are rich and involving, the action effectively drawn, and between them all, they’ll have you turning pages at a ridiculous rate, then going back to check out particular pages with your tongue hanging out at the sheer gorgeousness of some of the art. What we’re saying is – life is hard. You’ve got through it so far. You deserve a treat. Be nice to yourself – go get The Lost Dimension, Volume 1 today.